Top Brands / Always New. 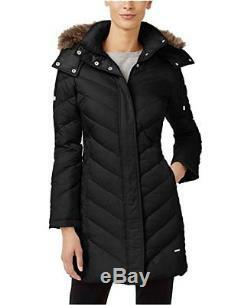 Kenneth Cole Women's Faux-Fur-Trim Chevron Quilted Down Coat XXL. Mixed quilting increases the style and warmth of Kenneth Cole's down-filled puffer coat. Faux fur trims the removable hood, creating a cozy frame for the face when the wind picks up. Stand collar; removable zip-off hood with fake fur trim Zipper closure with snap overlay at front Zipper pockets at hip Contrast quilting at sides Lined Mid-weight Hits at thigh; approx. 34 long Shell, and lining: polyester; trim: faux fur: acrylic/polyester; filler: duck down/waterfowl feathers Machine washable Imported. We are brick and mortar retailers based in New Jersey with over 50 years of combined experience in the off-price markets. Every item we sell is new and authentic. We source our products from some of the worlds largest retailers and wholesalers and vehemently stand behind everything we sell. If you're in the neighborhood please stop in and say hi. International order will understandably take a bit longer. Any product you return must be in the same condition you received it and in all the original packaging. Kenneth Cole Women's Faux-Fur-Trim Chevron Quilted Down Coat XXL Mixed quilting increases the style and warmth of Kenneth Cole's down-filled puffer coat. The item "Kenneth Cole Women's Faux-Fur-Trim Chevron Quilted Down Coat XXL" is in sale since Saturday, May 19, 2018. This item is in the category "Clothing, Shoes & Accessories\Women's Clothing\Coats, Jackets & Vests". The seller is "racksoffprice" and is located in Hoboken, New Jersey. This item can be shipped to United States, Canada, United Kingdom, Denmark, Romania, Slovakia, Bulgaria, Czech republic, Finland, Hungary, Latvia, Lithuania, Malta, Estonia, Australia, Greece, Portugal, Cyprus, Slovenia, Japan, Sweden, South Korea, Indonesia, Taiwan, South africa, Thailand, Belgium, France, Hong Kong, Ireland, Netherlands, Poland, Spain, Italy, Germany, Austria, Bahamas, Israel, Mexico, New Zealand, Philippines, Singapore, Switzerland, Norway, Saudi arabia, Ukraine, United arab emirates, Qatar, Kuwait, Bahrain, Croatia, Malaysia, Brazil, Chile, Colombia, Costa rica, Dominican republic, Panama, Trinidad and tobago, Guatemala, El salvador, Honduras, Jamaica, Antigua and barbuda, Aruba, Belize, Dominica, Grenada, Saint kitts and nevis, Saint lucia, Montserrat, Turks and caicos islands, Barbados, Bangladesh, Bermuda, Brunei darussalam, Bolivia, Ecuador, Egypt, French guiana, Guernsey, Gibraltar, Guadeloupe, Iceland, Jersey, Jordan, Cambodia, Cayman islands, Liechtenstein, Sri lanka, Luxembourg, Monaco, Macao, Martinique, Maldives, Nicaragua, Oman, Peru, Pakistan, Paraguay, Reunion, Viet nam.